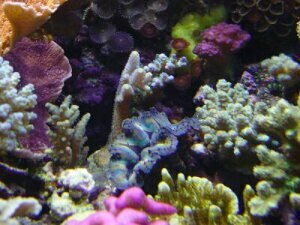 Since her christening in April 1999, and previous Tank of the Month feature in November 2000, Mistress Reef has undergone surprisingly few modifications. Aside from larger pumps and adding reactors to compensate for increased bioload, most of my early setup decisions panned out successfully. 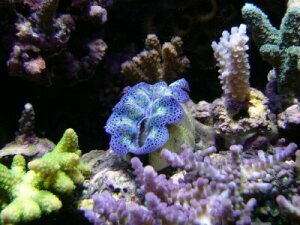 I've tried to maintain a consistent reef philosophy involving simplicity, efficiency, and cost effectiveness, yet still providing an environment which promotes the health of my inhabitants. 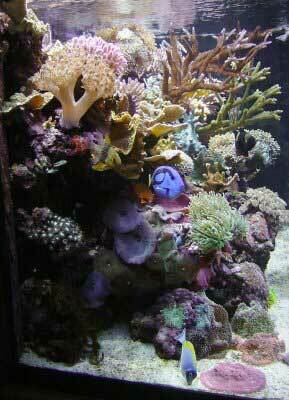 Throughout the past four years, the focus of my reefkeeping has remained the same: to create a work of living sculpture. Along the way I am perpetually learning about these delicate ecosystems. Though I began this endeavor partly for its attractiveness as an individual activity (not dependent on others or the weather), I've ironically formed many lasting friendships both locally and virtually, which otherwise would have been missed. 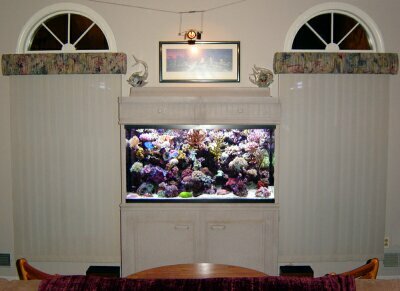 120-gallon AGA "reef ready" aquarium 48" x 24" x 24"
Return from the sump is via an externally plumbed Mag18, pushing nearly 800 gph through two rear corner flairs in the display tank. A Maxijet 1200 is located in each of the two built-in overflows, and is plumbed with Locline to opposite top front corners of the tank. Limited overflow capacity required that only one power head be on at a time, so a DIY wavemaker alternates at 30 second intervals. The AGA stock standpipes have been modified to raise the chamber water level several inches so bubbles sucked into the powerheads are reduced. Most other plumbing is rigid PVC. 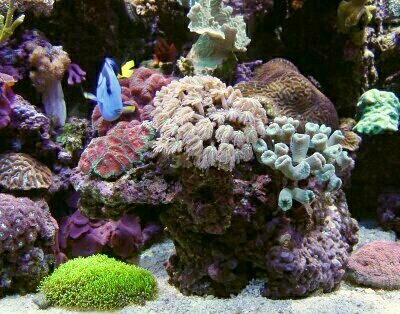 To provide circulation behind the "reef slope", there is an internal Rio 2500 on a spray bar against the back glass, completely hidden behind the rockwork. The inside of the canopy still has it's original white two-part epoxy paint, which has held up quite well considering the abuse it gets. Two specular aluminum reflectors were modified to fit into the raised vault of the hood, and these are due to be replaced in the spring during a canopy "overhaul" with DIY pieces. Daylight is provided from two 175-watt Ushio metal halide lamps, powered by Advance F-can ballasts. Fluorescent illumination comes from two 110-watt VHO actinic URI lamps run from an IceCap 430 ballast. Evening and "on demand" late night illumination is via a "red" 9-watt PC lamp (located on the center brace), running from an ordinary "exit sign" ballast. The sump is lit by a 27-watt PC quad lamp, whose ballast was part of an old outdoor yard light. 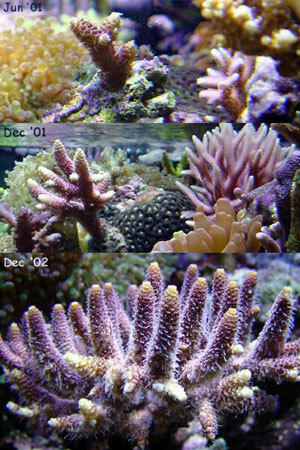 Its photoperiod is on the reverse schedule of the tank. All of the lighting is controlled through four individual timers. A dual range temperature controller runs both the 250 watt EboJager heater and the twin 4.5" DC canopy fans, based on the water temperature of the tank. This method provides exceptionally tight temperature control (typically less than 0.5°F variation) and is quite efficient as the fans only come on when needed (regardless of the light mode), and the heater will never be on simultaneously with the fans. Evaporation is reasonable (typically less than 1.5 gals/day) because of the control and enclosed hood. The drawbacks to this setup include high internal canopy temperatures (before the water heats up to turn the fans on), and condensation inside the canopy overnight. Convection vents at the top allow natural air circulation to reduce both of these conditions. During the summer months the tank is set at 82°F (house set to 76-78°F), and during the winter it is slowly lowered to 79°F (house set to 69°F). I may take several months to transition between these temperatures, based on the local temperatures. Although I admit to owning a few snake oils, they are rarely used. Besides water changes, a calcium reactor (a Geo with gas recirculation modification) provides the bulk of mineral replacement. The effluent is set at 80ml/min (pH 6.9) and CO2 at 40 bubbles/minute (media consumption ~1.25 lb. of CaribSea A.R.M. per month). Quite recently a DIY kalkwasser reactor was added for all top off water to help prevent pH depression from what I believe is due to the heavy invertebrate bioload. A 50 gpd RO with a three gallon pressurized storage tank and auto shut-off is located remotely and plumbed to the tank (and fridge :c). A DI cartridge polishes the water prior to entering the kalk reactor. A sump float switch is directly wired to a solenoid valve, allowing make up water into the sump at a rate controlled by a needle valve. A timer restricts top off to an hour every 8-12 hours at a rate of 100ml/hour or less. An additional high limit float switch provides further redundancy. Thus, even if the solenoid valve fails 'open', it would take close to 8 hours to fill the sump with 10 gallons of water. 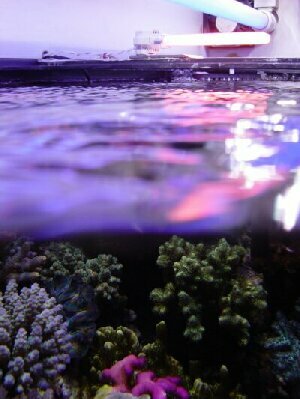 The overflows empty into a modified dish pan suspended on one end of the 20L sump. I used to periodically run floss (especially when "storming" the rock) under the outlet, and have always used about 1/2 cup of SeaChem Matrix carbon changed every week. About a year ago I noticed a general degradation in the health of the tank, so I started filtering the water more routinely. A 12" x 12" pad is now replaced every three days. A stock RedSea Berlin Classic powered from a Mag 7 (with inlet sponge to prevent impeller lock up via particulate) sits in the sump and does a minimal job of removing organics from the water column. About 1-1.5 cups of skimmate is removed per month. I usually spend a solid 10 hours per week taking care of this tank and it's inhabitants (my spouse says it's much longer). I really don't know where the time goes, but a great deal of it is spent "gardening". 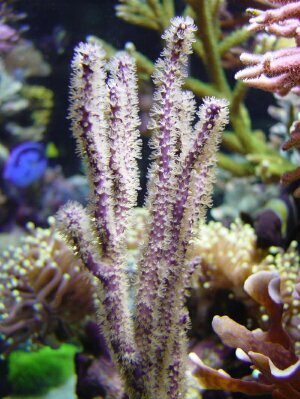 Without constant intervention, "everyone would end up killing themselves", since each coral's goal in life is to take over their world! 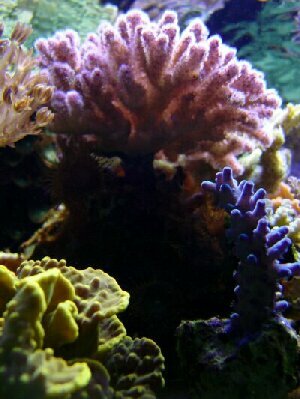 The rocks are basted off at least once per week along with a skimmer top end clean out. I periodically run fresh water through its venturi air intake such that total teardown is seldom required. I can always find something to do! 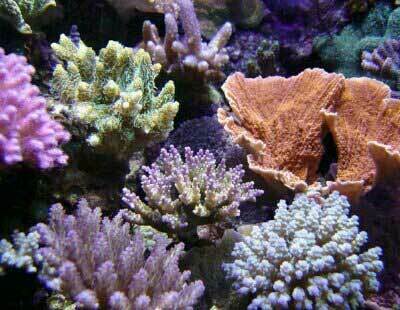 Nori is provided most days during the morning, and frozen food (Prime Reef or Mysis shrimp @ 2 cubes per feeding) or flake is fed on alternate evenings. 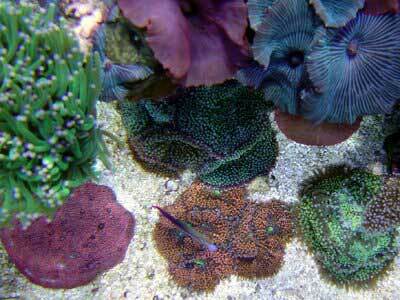 Some LPS corals are periodically target fed with small pieces of frozen shrimp. The rest get a moderate pinch of Vibra Gro, rolled between the thumb and forefinger underwater so it dissolves into a cloud (many thanks to Gary for this tip). 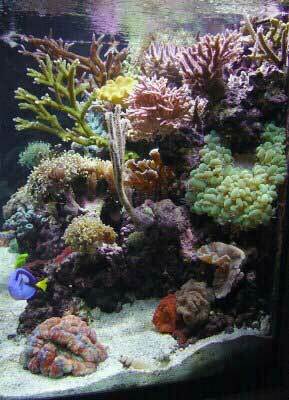 For me, reef keeping is the final frontier after decades of maintaining various aquaria. I believe the challenge of such a dynamic ecosystem is what keeps it exciting. 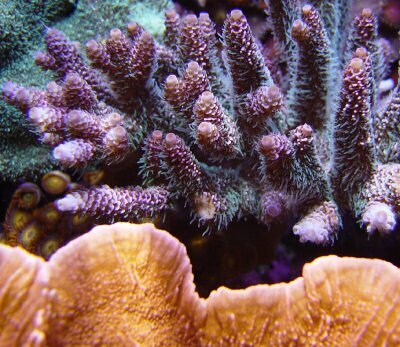 Initially, our goal might be centered around survival... As we progress, the objective matures toward longevity, then growth, color, and ultimately propagation and breeding. With so many disciplines to draw from (biology, chemistry, gardening, electricity, plumbing, and especially the art of patience), there is always something to hold our interest, not to mention build character! My personal preference towards a relatively high number of smaller colonies is in part due to trading amongst fellow hobbyists. 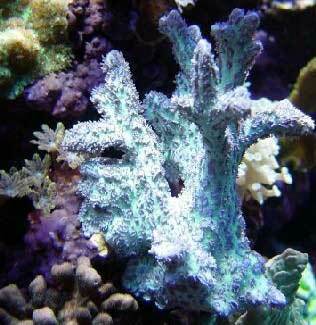 The initial "plan" was to continually search for the "ultimate" coral (the quest is half the fun! 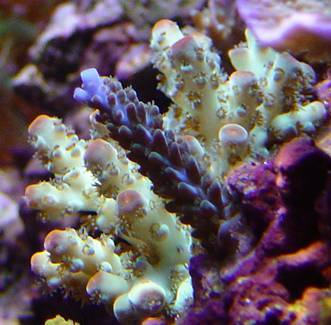 ), knowing that eventually each new addition would push a less interesting piece back to the LFS. However, since each animal has a unique story behind it, I have a difficult time choosing and have kept most. 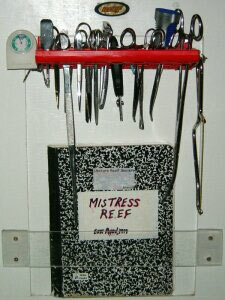 Over the past year, pruning has increased to the point that I can routinely offer fragments to fellow hobbyists. 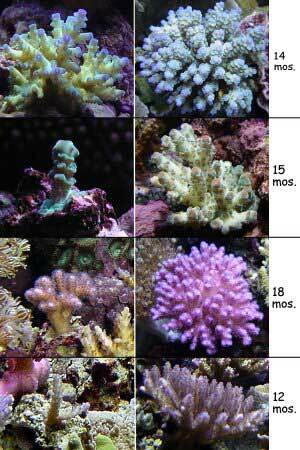 It's very rewarding, albeit a lot of work, to share corals that I once obtained similarly! With no plans to setup additional growout tanks (the mistress and my family wouldn't appreciate their lost time), the trick has been to maintain a manageable scale of selective propagation which allows the hobby to financially maintain itself. Thank you Reef Central, for allowing me to share this honor once more. We are quite fortunate to have each other through this medium to facilitate the learning process that propels captive reef keeping. I truly hope both the hobbyists and the industry behind them will share the responsibility in securing our future, not only through captive-raised animals, but also from sustainable wild harvesting. 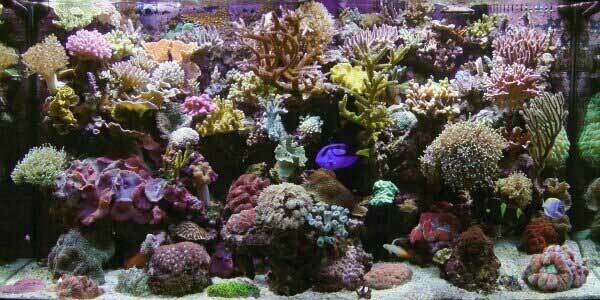 That is the only way to insure that reef aquariums won't become something we can only read about.